The Oklahoma Center for Nonprofits announced that the General Tommy Franks Leadership Institute and Museum has won the 2018 Moran Family Foundation and Inasmuch Foundation Award for Education, as well as a $7,500 grant. The Center held its 11th annual Oklahoma Nonprofit Excellence (ONE) Awards on Saturday in Tulsa, honoring 24 nonprofits of the 19,000 throughout the state for superior leadership and exceptional service to their constituents and communities. The ONE Awards honors a total of 24 organizations in eight categories: arts and humanities, community, education, health services, open services, self-sufficiency, seniors and youth development. Additionally, the Center names an overall winner of the event sponsored by the Tulsa Community Foundation. All 24 nonprofits receive at least a $5,000 prize, and category winners receive $7,500. The overall winner receives a grand prize of $10,000. This year’s grants bring the total awards to more than $1.65 million to nonprofit organizations in Oklahoma. Past Award of Excellence winners have included McCall’s Chapel School, Inc., United Way of Central Oklahoma, Myriad Gardens, Elder Care, Little Light House, Oklahoma FFA Foundation, the National Cowboy & Western Heritage Museum, Mental Health Association in Tulsa, Oklahoma Blood Institute and the Regional Food Bank of Oklahoma. Nonprofits may use the prize money as they see fit to aid current programs or make transformational changes for their organizations. 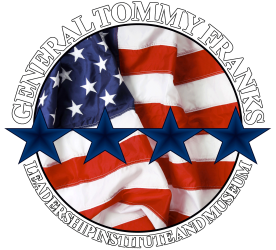 The General Tommy Franks Leadership Institute and Museum was created as a historical foundation dedicated to telling the story of the United States military and education. Its mission is to advance the development of this world-class leadership training institution and museum. For more information, visit TommyFranksMuseum.org.